The African Development Bank called on global partners to join hands to lift one billion people worldwide out of hunger and said it was leading the way by investing US$24 billion in African agriculture over the next 10 years in the largest such effort ever. 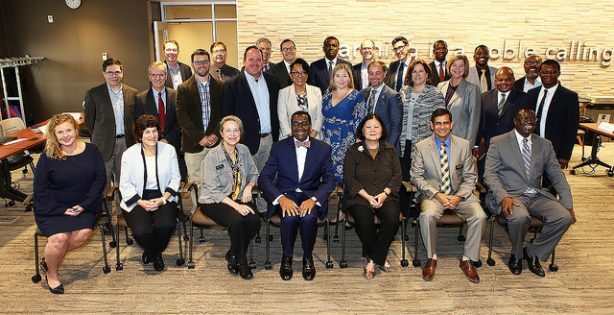 “We are not winning the war against global hunger,” Bank President Akinwumi Adesina told an agriculture conference at Purdue University in Indianapolis on Tuesday, 25 September. “We must not get carried away,” he added, referring to statistics showing a decline in the global population living on less than two dollars per day. In reality, the number of hungry people in the world had increased from 777 million in 2015 to 815 million in 2016, he said citing the latest World Food Security and Nutrition data. Adesina told the audience that included researchers, implementing organizations, business leaders, policymakers and donors that simple technical and scientific methods were already making a whole difference to farm yields and income in Africa. While such technologies to deliver Africa’s green revolution exist, they are mostly just sitting on the shelves, he said. The conference on “ Scaling Up Agricultural Technologies for Transformation” marked Adesina’s fond return to his alma mater. “It was here, as a graduate student, that I began the journey of searching for ways to get technologies into the hands of millions of farmers,” he said. Adesina was to go on to make a huge impact on the transformation of agriculture in Africa, including implementing game-changing policies in his years as Nigeria’s Minister for Agriculture and Rural Development before taking up his post at the Bank in September 2015. Adesina said the situation in Sub-Saharan Africa needed particularly urgent intervention due to the ravages of climate change. The International Food Policy Research Institute estimates that Africa will add 38 million to its number of hunger stricken people by 2050 as a result of climate change. The Institute forecasts that Africa will experience major food shortages by 2020 and beyond, while malnutrition will be on the rise over the next 20 years. The Bank’s ongoing initiatives had the objectives of growing income for farmers, stabilizing prices for staple crops, reducing losses and stimulating multiplier effects in local economies. With its Staple Crop Processing Zones and other initiatives, the Bank is demonstrating how this can be done. “The African Development Bank put feeding Africa as one of its topmost priorities when it launched its Feed Africa strategy in 2015 and is investing $ 24 billion in agriculture for Africa over 10 years – the largest ever such effort,” the Bank President said. Across Africa, the Feed Africa Strategy is supporting the development of policies, markets, infrastructure and institutions that will ensure that agricultural value chains are well developed and that technologies reach several millions of farmers.